At Lodi Shell Auto Sales and Repairs, we take care to provide our customers high quality services personalized for their unique needs. Our auto mechanics are available for light truck and auto repair from 7 am to 5 pm Monday through Friday, and from 7 am to Noon on Saturday. Contact us for your 24 Hour Towing! Official Rawhide donation drop off site for cars, trucks and boats. At Lodi Shell we specialize in your complete automotive repairs needs. Computer Diagnostics: Is YOUR engine light on? All with a door to door small town service. Contact us or call us at 608-592-3722 to schedule an appointment. 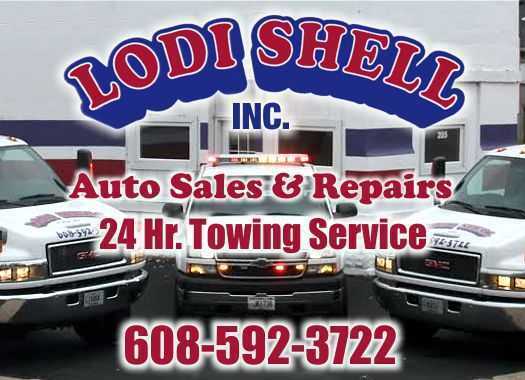 Page Summary: Lodi Shell offers auto repair, car service, auto repair shops and auto mechanic. Products and services such as auto shop, car mechanic, auto repair shop as well as truck repair are also part of the scope of our business. We also specialize in auto mechanics, auto repair estimates in Sauk City, Middleton, Arlington as well as Lodi. Other areas we serve include Poynette, Merrimac, Lake Wisconsin and Waunakee. We also service De Forest, Dane and beyond.